Learning how to write the perfect pin description for Pinterest can mean the difference between you being found by your ideal clients and not showing up at all in their searches. There are two parts to an ideal pin: the photo and the description. Given that Pinterest is a search engine, it’s the description that is going to determine if you’re found. 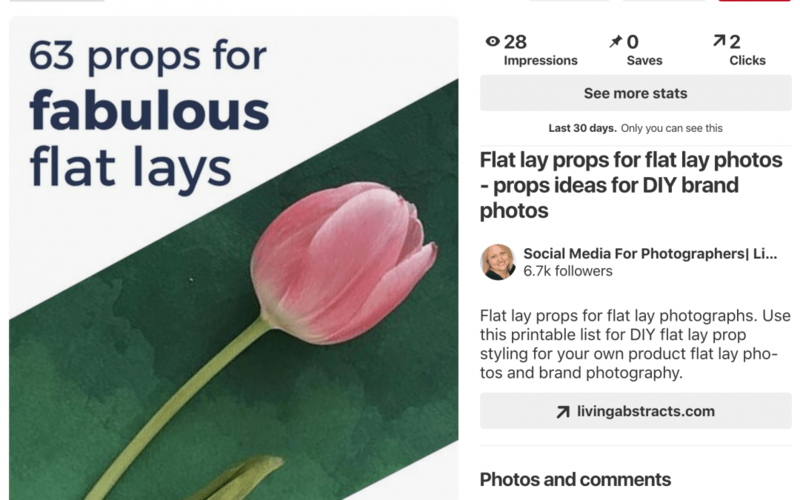 Below are seven tips for writing the perfect pin description for Pinterest to drive more traffic to your photography website. What is a Pinterest image description? A Pinterest image description is what is shown below the pin on Pinterest. A description can be either auto-filled from content on your site or can be added or edited by the pinner. A pin description has three jobs. It helps explain what the pin is about, it helps the pin be found in Pinterest’s search function and it entices pinners to click through to your website. Do I have to write a pin description? Ideally, yes. When you’re adding pins to Pinterest, writing a bespoke description gives you the best chance of your pin being found and enticing people to your website. It’s helpful in a similar way to writing individual alt tags for each of your website or blog photos. If you’ve been doing that, you already have great skills for writing pin descriptions. Doesn’t Pinterest automatically add a pin description? It depends. There are two ways of adding pins to your Pinterest boards. You can pin directly from your site, in which case Pinterest will pull through a description from your website or blog from existing content. And you can add a pin while inside Pinterest. You upload a pin image, URL of where people should go if wanting more information based on your pin and a description. Note that Pinterest will force you to write at least one character in the description in order to pin. When we are researching keywords for our SEO, we often think about the searcher intent. What are people searching for and why? It’s the same on Pinterest. Ask yourself what your ideal client is searching for? Let’s say that your ideal client lives in the US and wants to get married in a Scottish castle. They might search for ‘Scottish castle weddings’, ‘Scottish castle elopements’ or ‘Scottish castle wedding photos’. At this point, they may not be searching for photographers, but if you come up in search for those terms, you could be hired ahead of anyone else who is writing a description optimised for ‘Eileen Donan Castle wedding photographer’. Notice that they aren’t looking for the name of the venue or a city because they’re at the start of their search and don’t have that information yet. You could write other descriptions for similar pins which DO mention the venue for when your ideal client gets to that point, so you’re covered in both situations. Now that your keyword strategy for Pinterest is solid, write for people to read. To go back to the Scottish castle example, you might say: ‘Scottish castle wedding inspiration: a bride and groom elope to picturesque Eileen Donan Castle in the Highlands of Scotland’. Or ‘A bride surrounded by her three bridesmaids at her fairytale wedding at Dalhousie Castle, Scotland.’ You get the picture. Pinterest now encourages hashtags, after years of refusing to have them as part of its search. While hashtags on Pinterest still seem to be a work in progress, early feedback from pinners is that hashtags help with visibility. Pinterest gives you 500 characters for your description. This is roughly a couple of sentences and couple of hashtags, as we’ve described above. It’s enough for including multiple keywords and phrases that describe your pin. Do be aware that if your description is longer than 500 characters, Pinterest won’t warn you until you are adding your pin to a board and stops the process, rather than allowing you to edit your description. Tell people what to do – it really helps improve click-through and pinning rates. It might be as simple as telling people to ‘pin for later’ or suggesting they ‘click through to see the rest of this fairytale Scottish elopement’. You can split test your pin descriptions – try pinning the same photo with different descriptions and see which gets most repins and drives most traffic to your site. You can check which pins have driven most traffic to your website in Google analytics. You find Pinterest traffic by looking in the Acquisition section and then under Social. The chances are in many of your pins, that you can mention other businesses. If your pin is from a wedding, you could mention the Pinterest account of the relevant dress shop, florist, cake maker or venue. You can mention a Pinterest account in the pin description by typing the @ sign and waiting for the dropdown, similar to using Instagram mentions. You may need to open another window and search for the supplier; not everyone has a Pinterest account and their account name may not be one that comes up easily. It it helpful to the pinner (your potential client) to have details of fellow suppliers and the fellow supplier will receive a notification of your mention. It may lead to them repinning your pin and closer relationships between the two of you. So there you have seven tips for writing the perfect pin description for Pinterest. Do let me know how these work for you and if you have any questions.